Lima, Ohio has introduced their very own local celebrity Terry Watson in a major way. 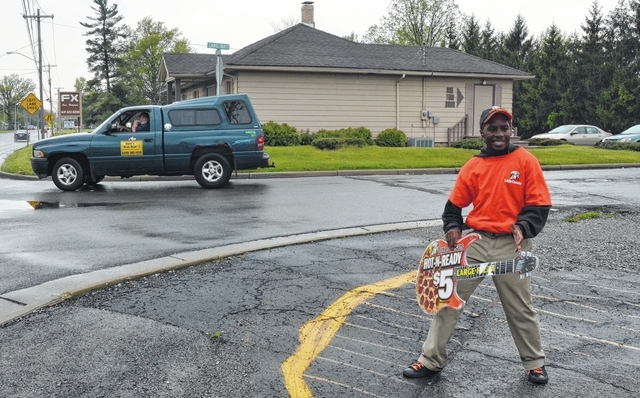 Terry Watson, known locally as the “Little Caesar’s Dancing Guy,” entertains passers-by on a daily basis with his sign spinning and dance routine. On May 4, the local celebrity took his talents from the parking lots of Lima to the big stage in Las Vegas, where he placed second in the Little Caesar’s shaker board contest. 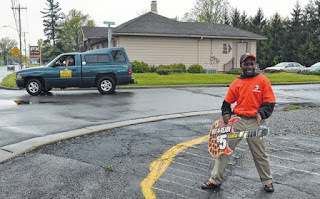 The shaker board contest is a competition among Little Caesar’s restaurants across the U.S. and the world. Each franchise sends in a video of their “shaker board dancer” to the company’s corporate office, where a panel of executives reviews the tapes and selects three people to attend the international contest in Las Vegas. Watson was chosen out of hundreds of applicants, and received an all-expenses-paid trip to compete during Little Caesar’s annual franchisee meeting. Watson said he was “shocked” that he was chosen, but his boss, Ron Massey, wasn’t the least bit surprised. Massey said Watson has a “thousand-watt smile that everyone loves,” and that it’s not uncommon for customers and passers-by to hand him money or Kewpee hamburgers. “I call him the richest man in Lima,” Massey said. Back at work Tuesday, Watson was only a few minutes into his routine before he started getting honks and waves from drivers passing by the restaurant. He said in the past, he’s had children take pictures with him and ask for his autograph. Despite his celebrity status, Watson said he doesn’t let it go to his head.